Anyone who’s ever watched Who do you think you are? will know that ancestor hunting takes its subjects to unexpected places. It led me to Eva Elwes, playwright and actress, and my great-aunt. The chase has involved many hours searching genealogy resources and the British Newspaper Archive, a trip across the globe to the British Library and other archives, and the chance discovery of the Great War Theatre project website. I began delving into my family history about 5 years ago. Searching the genealogy databases I found we had a Great-Aunt Gertrude whose existence seemed to have been erased from family memory. I am grateful that my cousin still has our grandmother’s address book. When we checked it we found Gertrude’s name and several addresses. On the same page there was the name Eva Elwes. Was she a friend or a lodger? A Google search showed that Eva Elwes was an actress and playwright, but a check of the databases retrieved nothing. At this point my memory stirred and I recalled my mother telling me her aunt was an actress. My siblings and cousins couldn’t corroborate this. Self-doubt kicked in; perhaps I’d imagined it. But as I searched I found that Gertrude’s addresses in my grandmother’s book correlated with those I found for her in online databases and for Eva in advertisements in The Stage and The Era. It seemed that Eva and Great-Aunt Gertrude were one and the same. Jumping to conclusions is fatal but I dared to hope. One day, in early 2016, I idly entered “Eva Elwes” into Proquest, an academic database, and up popped a death notice in The Stage giving her stage and given names. Bingo! The rest is not quite history. In fact I like to think I’m creating a bit of history. As I started to read about British theatre in the early twentieth century I realised that there is precious little information on women playwrights of the period. In Innocent Flowers: Women in the Edwardian theatre Julie Holledge estimates that there were over 400 women playwrights in the period 1900-1920. But it’s very hard to find much about them. I’ve made a start by creating a Wikipedia page on Eva. The Great War Theatre project will no doubt find more of these long-lost playwrights. For the past two and a half years I’ve spent many hours in that indispensable resource that is the British Newspaper Archive. Without any letters or diaries (I still hope that perhaps they’re hidden away in an archive somewhere) I’ve been reconstructing Eva’s life from what I can find out about her plays and her performing. Eva was born in Frome in 1876, and at fifteen was a draper’s apprentice. Following this she became an actress and in 1898 she married her first husband, the actor, Henry Gilpin. They were cast together in several productions from 1896-1899. In the 1911 census she was registered as Eva Eykyn, ‘wife’ of Ernest Eykyn, though they did not marry until 1925. Their marriage certificate records Eva as a widow. Ernest Eykyn was also an actor and a stage artist. 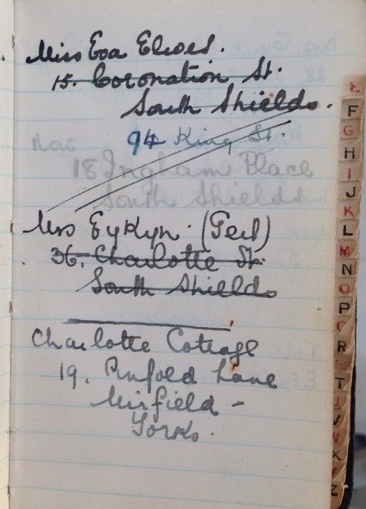 During the Great War they lived in Walsall, moving to South Shields in 1921 where Eva managed the Alexandra Theatre and continued to act and write plays. These sketchy facts of her life throw up just as many questions as answers. How did a young woman living in Somerset find her way to the London theatre scene? How did she choose her stage name? What motivated her to write plays and how did she get, and develop, her writing talent? What happened to her first marriage? Did her first husband refuse a divorce and make her wait until he died before she could remarry? Why did they move to South Shields and run a theatre? Was she active in the suffrage movement? Eva penned 17 plays (all melodramas) during WW1. I’ve read all the Examiners’ reports for her plays in the British Library. It’s possible that no one has looked at these files for one hundred years until I and the Great War Theatre project volunteer requested them. I wonder if we were in the library at the same time? At the very least we must have been there within a few months of each other. The hunting continues. Even though I’m neither a theatre expert or have a particular interest in WW1 history I’ve been learning a lot about British theatre. Five years ago I wouldn’t have believed I’d be writing a blog post for the Great War Theatre project. Genealogy has led me down an unexpected path!